Only 3,100 of the 13,600 internees held in Britain on 22 September, 1914, originated on the battlefields. Most of the remaining 10,500 came from the German civilian community in Britain. The number of captured German naval and military personnel remained low throughout the early stages of the war. On 4th February, 1916, Mr Edward Lowry of the US Embassy inspected the camp. The report started off with these useful statistics: Stobs housed 4,616 prisoners, of whom 1,829 were soldiers, 504 sailors and 2,283 civilians. Of the civilians, 2,098 were Germans, 181 Austrians, 3 Turks and 1 Bulgarian. 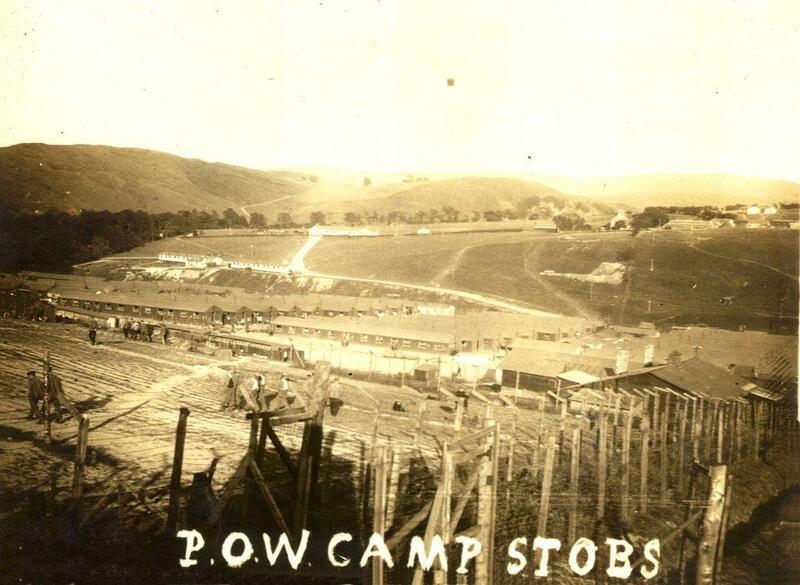 However the number of prisoners from the German army and naval personnel was increasing and Stobs became a military only PoW camp until the end of the war. 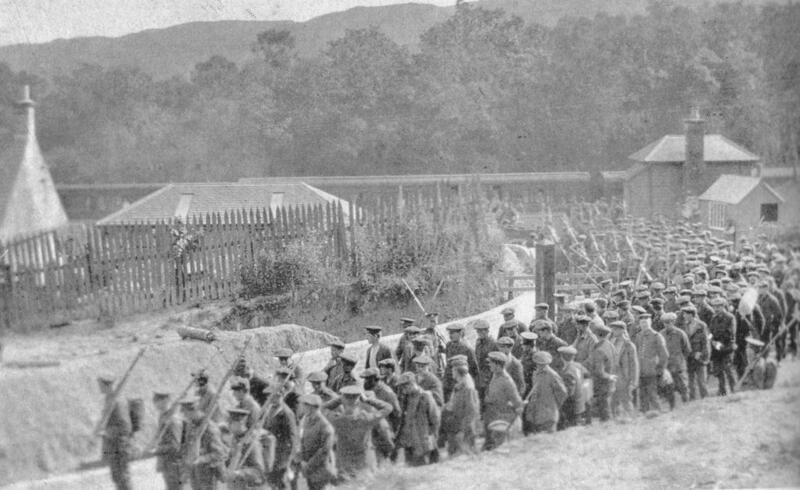 German military prisoners arriving at Stobs Station – possibly the summer of 1915. To house the prisoners, the PoW camp consisted of the following by 1917: A large compound measuring internally about 750m by 280m surrounded by a heavy triple barbed wire fence which had electric lights at intervals. There was a sentry post at each of the corners of the compound fence and other posts at 70-100 metre intervals round the perimeter. 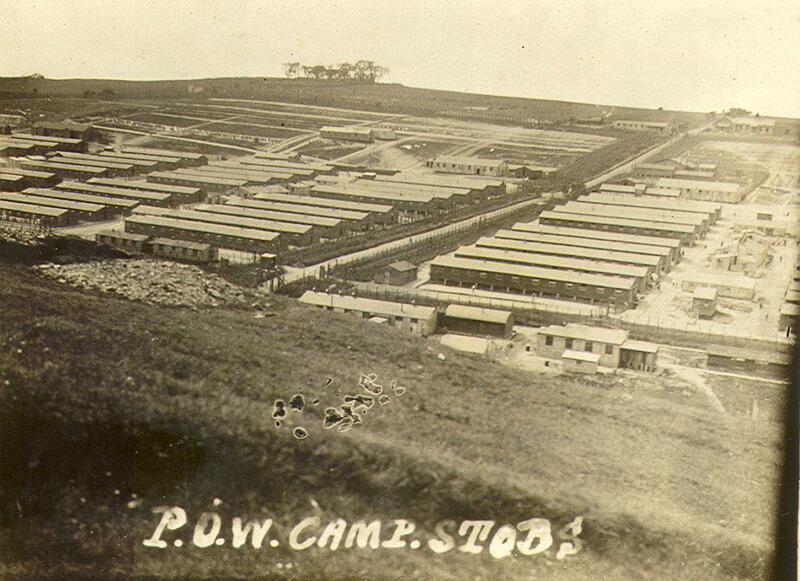 Within the larger compound there were four subsidiary compounds known as ‘A Camp’, ‘B Camp’, ‘C Camp’ and ‘D Camp’. These were separated from each other by fences. Each of the four ‘Camp’ compounds contained four sets of five huts measuring 120ft by 20ft (D Camp having one fewer). To the north of the built up area each ‘Camp’ had a roughly rectangular open exercise yard. The camp hospital comprised six ‘ward’ huts accompanied by an administration block, kitchen, operating theatre and mortuary.